Ideally, your virtual workforce will see employees happily ‘telecommuting’ a few days per week. They will work seamlessly with their colleagues, whether they’re in the office or connecting via an online working hub. They’ll be more productive due to having fewer distractions and less stress from a long commute. Creating this positive environment, and sidestepping potential risks that can arise with virtual working will require little planning and implementing certain precautions. So, how can you create a virtual workforce that is positive, functional and effective? Your first step should be to set up a virtual workforce with strong foundations and then follow best practice to ensure workers get the most out of this approach. By implementing the following five steps, you’ll be well on your way to creating a powerful virtual workforce. As with any new business initiative, you need to draw up the pros and cons of creating a virtual workforce. Is it really appropriate for your business? And, if so, which departments in particular? Your business may not be at a mature enough stage to warrant a virtual workforce; sit down with a project team and map out the costs and benefits of this approach and decide it it’s really the right thing for the way you work. What would be the potential benefits? What drawbacks might arise? Virtual work forces are only possible with the appropriate technology in place. It’s therefore worthwhile to assess a range of products from major providers. Some companies choose to opt for a major provider that can offer a central tool (such as Microsoft’s Office 365) to access everything virtually. Others opt for a ‘mix and match’ approach, using different tools from a range of smaller providers for more specific processes. Before initiating your virtual workforce company-wide, it’s best practice to test the new approach with a small team. Learn lessons from that team and draw up some best practice guidelines before deploying company-wide. When employees are working remotely, they should have a clear understanding of the work they are expected to do. While in the office, it can be clearer what task they should be doing and they are typically given additional ad-hoc tasks as and when such work arises. By contrast, at home, their ‘to do’ list might be less obvious. You should ensure you have a system to manage people’s task lists, diaries and provide visibility into people’s activity. There is a huge range of available tools that allow the virtual workforce to communicate, many of which might be more appropriate than lengthy email chains that inundate inboxes. Your virtual workforce can benefit from a diversity of instant messaging tools; ‘WhatsApp’ style enterprise text messengers, VoIP (Voice over IP – such as Skype) and online applications which allow for more natural and immediate conversations. From choosing the right technology to advising on change management and providing training, Amshire can help you seamlessly implement these five steps. 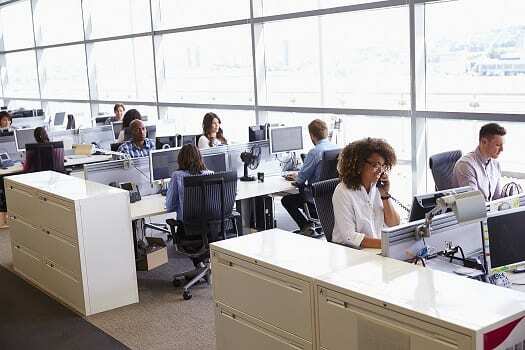 A smaller, leaner, less expensive office means less requirement to provide a large space for all personnel, all the time. Virtual access to files, presentations and key documents can be highly useful to travelling salespeople. Being able to access key documentation straight from a project site keeps everyone up to date.